Sally Wattle ( Acacia melanoxylon ). 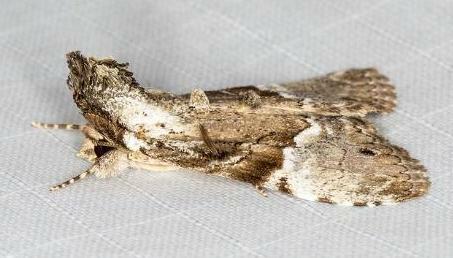 The adult moth is brown. The forewings have a complex pattern. 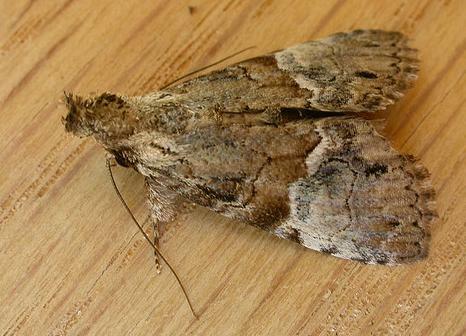 The hindwings are dark brown at the margins, fading to pale brown at the bases. The moth has a wing span of about 4 cms. The moth has an unusual natural posture: lying flat with a large crest erected over its head and thorax. Melbourne University Press, 1990, fig. 45.3, p. 450. Volume 53 (1929), p. 301.